This is one of the few articles that I've published on my site that is not written by me. I've always tried to keep all of the content based on my own writings. However, I simply had to make this article available to you because I feel it is one of the most important articles you will ever read with respect to REAL nutrition...not the propaganda loaded on you by the big powerful food manufacturing companies. I read this article a few years back (along with some of Mary and Sally's other writings) and it has totally changed the way I think about nutrition for the better. The article is long and gets a little technical, but contains so much useful information that is important to your health and that of your family, I just had to share it with you. It's written by a PhD in Nutritional Biochemistry, and I think that's important to note, since so much nutrition info out there these days is skewed by marketing interests. You don't have to worry about that in this article as it's as unbiased as it can be. Please, this is a MUST-READ for your health... don't skip reading this article... it contains SO MUCH more than just a discussion about saturated fat. You'll see what I mean when you dig in below. The theory—called the lipid hypothesis—that there is a direct relationship between the amount of saturated fat and cholesterol in the diet and the incidence of coronary heart disease was proposed by a researcher named Ancel Keys in the late 1950’s. Numerous subsequent studies have questioned his data and conclusions. Nevertheless, Keys’ articles received far more publicity than those presenting alternate views. The vegetable oil and food processing industries, the main beneficiaries of any research that found fault with competing traditional foods, began promoting and funding further research designed to support the lipid hypothesis. The most well-known advocate of the lowfat diet was Nathan Pritikin. Actually, Pritikin advocated elimination of sugar, white flour and all processed foods from the diet and recommended the use of fresh raw foods, whole grains and a strenuous exercise program; but it was the lowfat aspects of his regime that received the most attention in the media. Adherents found that they lost weight and that their blood cholesterol levels and blood pressure declined. The success of the Pritikin diet was probably due to a number of factors having nothing to do with reduction in dietary fat—weight loss alone, for example, will precipitate a reduction in blood cholesterol levels—but Pritikin soon found that the fat-free diet presented many problems, not the least of which was the fact that people just could not stay on it. Those who possessed enough will power to remain fat-free for any length of time developed a variety of health problems including low energy, difficulty in concentration, depression, weight gain and mineral deficiencies.1 Pritikin may have saved himself from heart disease but his lowfat diet did not spare him from cancer. He died, in the prime of life, of suicide when he realized that his Spartan regime was not curing his leukemia. We shouldn’t have to die of either heart disease or cancer—or consume a diet that makes us depressed. When problems with the no-fat regime became apparent, Pritikin introduced a small amount of fat from vegetable sources into his diet—something like 10% of the total caloric intake. Today the Diet Dictocrats advise us to limit fats to 25-30% of the caloric intake, which is about 2 1/2 ounces or 5 tablespoons per day for a diet of 2400 calories. 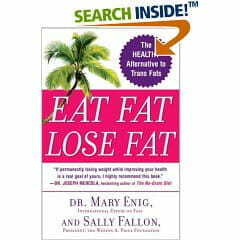 A careful reckoning of fat intake and avoidance of animal fats, they say, is the key to perfect health. The Lipid Research Clinics Coronary Primary Prevention Trial (LRC-CPPT), which cost 150 million dollars, is the study most often cited by the experts to justify lowfat diets. Actually, dietary cholesterol and saturated fat were not tested in this study as all subjects were given a low-cholesterol, low-saturated-fat diet. Instead, the study tested the effects of a cholesterol-lowering drug. Their statistical analysis of the results implied a 24% reduction in the rate of coronary heart disease in the group taking the drug compared with the placebo group; however, nonheart disease deaths in the drug group increased—deaths from cancer, stroke, violence and suicide.7 Even the conclusion that lowering cholesterol reduces heart disease is suspect. Independent researchers who tabulated the results of this study found no significant statistical difference in coronary heart disease death rates between the two groups.8 However, both the popular press and medical journals touted the LRC-CPPT as the long-sought proof that animal fats are the cause of heart disease, America’s number one killer. Numerous surveys of traditional populations have yielded information that is an embarrassment to the Diet Dictocrats. For example, a study comparing Jews when they lived in Yemen, whose diets contained fats solely of animal origin, to Yemenite Jews living in Israel, whose diets contained margarine and vegetable oils, revealed little heart disease or diabetes in the former group but high levels of both diseases in the latter.14 (The study also noted that the Yemenite Jews consumed no sugar but those in Israel consumed sugar in amounts equaling 25-30% of total carbohydrate intake.) A comparison of populations in northern and southern India revealed a similar pattern. People in northern India consume 17 times more animal fat but have an incidence of coronary heart disease seven times lower than people in southern India.15 The Masai and kindred tribes of Africa subsist largely on milk, blood and beef. They are free from coronary heart disease and have excellent blood cholesterol levels.16 Eskimos eat liberally of animal fats from fish and marine animals. On their native diet they are free of disease and exceptionally hardy.17 An extensive study of diet and disease patterns in China found that the region in which the populace consumes large amounts of whole milk had half the rate of heart disease as several districts in which only small amounts of animal products are consumed.18 Several Mediterranean societies have low rates of heart disease even though fat—including highly saturated fat from lamb, sausage and goat cheese—comprises up to 70% of their caloric intake. The inhabitants of Crete, for example, are remarkable for their good health and longevity.19 A study of Puerto Ricans revealed that, although they consume large amounts of animal fat, they have a very low incidence of colon and breast cancer.20 A study of the long-lived inhabitants of Soviet Georgia revealed that those who eat the most fatty meat live the longest.21 In Okinawa, where the average life span for women is 84 years—longer than in Japan—the inhabitants eat generous amounts of pork and seafood and do all their cooking in lard.22 None of these studies is mentioned by those urging restriction of saturated fats. Clearly something is wrong with the theories we read in the popular press—and used to bolster sales of lowfat concoctions and cholesterol-free foods. The notion that saturated fats per se cause heart disease as well as cancer is not only facile, it is just plain wrong. But it is true that some fats are bad for us. In order to understand which ones, we must know something about the chemistry of fats. Fats—or lipids—are a class of organic substances that are not soluble in water. In simple terms, fatty acids are chains of carbon atoms with hydrogen atoms filling the available bonds. Most fat in our bodies and in the food we eat is in the form of triglycerides, that is, three fatty-acid chains attached to a glycerol molecule. Elevated triglycerides in the blood have been positively linked to proneness to heart disease, but these triglycerides do not come directly from dietary fats; they are made in the liver from any excess sugars that have not been used for energy. The source of these excess sugars is any food containing carbohydrates, particularly refined sugar and white flour. Saturated: A fatty acid is saturated when all available carbon bonds are occupied by a hydrogen atom. They are highly stable, because all the carbon-atom linkages are filled—or saturated—with hydrogen. This means that they do not normally go rancid, even when heated for cooking purposes. They are straight in form and hence pack together easily, so that they form a solid or semisolid fat at room temperature. Your body makes saturated fatty acids from carbohydrates and they are found in animal fats and tropical oils. Monounsaturated: Monounsaturated fatty acids have one double bond in the form of two carbon atoms double-bonded to each other and, therefore, lack two hydrogen atoms. Your body makes monounsaturated fatty acids from saturated fatty acids and uses them in a number of ways. Monounsaturated fats have a kink or bend at the position of the double bond so that they do not pack together as easily as saturated fats and, therefore, tend to be liquid at room temperature. Like saturated fats, they are relatively stable. They do not go rancid easily and hence can be used in cooking. The monounsaturated fatty acid most commonly found in our food is oleic acid, the main component of olive oil as well as the oils from almonds, pecans, cashews, peanuts and avocados. Polyunsaturated: Polyunsaturated fatty acids have two or more pairs of double bonds and, therefore, lack four or more hydrogen atoms. The two polyunsaturated fatty acids found most frequently in our foods are double unsaturated linoleic acid, with two double bonds—also called omega-6; and triple unsaturated linolenic acid, with three double bonds—also called omega-3. (The omega number indicates the position of the first double bond.) Your body cannot make these fatty acids and hence they are called "essential." 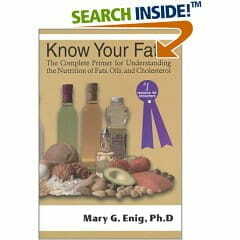 We must obtain our essential fatty acids or EFA's from the foods we eat. The polyunsaturated fatty acids have kinks or turns at the position of the double bond and hence do not pack together easily. They are liquid, even when refrigerated. The unpaired electrons at the double bonds makes these oils highly reactive. They go rancid easily, particularly omega-3 linolenic acid, and must be treated with care. Polyunsaturated oils should never be heated or used in cooking. In nature, the polyunsaturated fatty acids are usually found in the cis form, which means that both hydrogen atoms at the double bond are on the same side. All fats and oils, whether of vegetable or animal origin, are some combination of saturated fatty acids, monounsaturated fatty acids and polyunsaturated linoleic acid and linolenic acid. In general, animal fats such as butter, lard and tallow contain about 40-60% saturated fat and are solid at room temperature. Vegetable oils from northern climates contain a preponderance of polyunsaturated fatty acids and are liquid at room temperature. But vegetable oils from the tropics are highly saturated. Coconut oil, for example, is 92% saturated. These fats are liquid in the tropics but hard as butter in northern climes. Vegetable oils are more saturated in hot climates because the increased saturation helps maintain stiffness in plant leaves. Olive oil with its preponderance of oleic acid is the product of a temperate climate. It is liquid at warm temperatures but hardens when refrigerated. Medium-chain fatty acids have eight to twelve carbon atoms and are found mostly in butterfat and the tropical oils. Like the short-chain fatty acids, these fats have antimicrobial properties; are absorbed directly for quick energy; and contribute to the health of the immune system. Long-chain fatty acids have from 14 to 18 carbon atoms and can be either saturated, monounsaturated or polyunsaturated. Stearic acid is an 18-carbon saturated fatty acid found chiefly in beef and mutton tallows. Oleic acid is an 18-carbon monounsaturated fat which is the chief component of olive oil. Another monounsaturated fatty acid is the 16-carbon palmitoleic acid which has strong antimicrobial properties. It is found almost exclusively in animal fats. The two essential fatty acids are also long chain, each 18 carbons in length. Another important long-chain fatty acid is gamma-linolenic acid (GLA) which has 18 carbons and three double bonds. It is found in evening primrose, borage and black currant oils. Your body makes GLA out of omega-6 linoleic acid and uses it in the production of substances called prostaglandins, localized tissue hormones that regulate many processes at the cellular level. The public has been fed a great deal of misinformation about the relative virtues of saturated fats versus polyunsaturated oils. Politically correct dietary gurus tell us that the polyunsaturated oils are good for us and that the saturated fats cause cancer and heart disease. The result is that fundamental changes have occurred in the Western diet. At the turn of the century, most of the fatty acids in the diet were either saturated or monounsaturated, primarily from butter, lard, tallows, coconut oil and small amounts of olive oil. Today most of the fats in the diet are polyunsaturated from vegetable oils derived mostly from soy, as well as from corn, safflower and canola. Modern diets can contain as much as 30% of calories as polyunsaturated oils, but scientific research indicates that this amount is far too high. The best evidence indicates that our intake of polyunsaturates should not be much greater than 4% of the caloric total, in approximate proportions of 1 1/2 % omega-3 linolenic acid and 2 1/2 % omega-6 linoleic acid.30 EFA consumption in this range is found in native populations in temperate and tropical regions whose intake of polyunsaturated oils comes from the small amounts found in legumes, grains, nuts, green vegetables, fish, olive oil and animal fats but not from commercial vegetable oils. Saturated 18-carbon stearic acid and 16-carbon palmitic acid are the preferred foods for the heart, which is why the fat around the heart muscle is highly saturated.43 The heart draws on this reserve of fat in times of stress. Recent research shows that cholesterol acts as an antioxidant.47 This is the likely explanation for the fact that cholesterol levels go up with age. As an antioxidant, cholesterol protects us against free radical damage that leads to heart disease and cancer. Cholesterol is needed for proper function of serotonin receptors in the brain.48 Serotonin is the body's natural "feel-good" chemical. Low cholesterol levels have been linked to aggressive and violent behavior, depression and suicidal tendencies. Dietary cholesterol plays an important role in maintaining the health of the intestinal wall.49 This is why low-cholesterol vegetarian diets can lead to leaky gut syndrome and other intestinal disorders. Cholesterol is not the cause of heart disease but rather a potent antioxidant weapon against free radicals in the blood, and a repair substance that helps heal arterial damage (although the arterial plaques themselves contain very little cholesterol.) However, like fats, cholesterol may be damaged by exposure to heat and oxygen. This damaged or oxidized cholesterol seems to promote both injury to the arterial cells as well as a pathological buildup of plaque in the arteries.50 Damaged cholesterol is found in powdered eggs, in powdered milk (added to reduced-fat milks to give them body) and in meats and fats that have been heated to high temperatures in frying and other high-temperature processes. The cause of heart disease is not animal fats and cholesterol but rather a number of factors inherent in modern diets, including excess consumption of vegetables oils and hydrogenated fats; excess consumption of refined carbohydrates in the form of sugar and white flour; mineral deficiencies, particularly low levels of protective magnesium and iodine; deficiencies of vitamins, particularly of vitamin C, needed for the integrity of the blood vessel walls, and of antioxidants like selenium and vitamin E, which protect us from free radicals; and, finally, the disappearance of antimicrobial fats from the food supply, namely, animal fats and tropical oils.52 These once protected us against the kinds of viruses and bacteria that have been associated with the onset of pathogenic plaque leading to heart disease. While serum cholesterol levels provide an inaccurate indication of future heart disease, a high level of a substance called homocysteine in the blood has been positively correlated with pathological buildup of plaque in the arteries and the tendency to form clots—a deadly combination. Folic acid, vitamin B6 , vitamin B12 and choline are nutrients that lower serum homocysteine levels.53 These nutrients are found mostly in animal foods. The best way to treat heart disease, then, is not to focus on lowering cholesterol—either by drugs or diet—but to consume a diet that provides animal foods rich in vitamins B6 and B12 ; to bolster thyroid function by daily use of natural sea salt, a good source of usable iodine; to avoid vitamin and mineral deficiencies that make the artery walls more prone to ruptures and the buildup of plaque; to include the antimicrobial fats in the diet; and to eliminate processed foods containing refined carbohydrates, oxidized cholesterol and free-radical-containing vegetable oils that cause the body to need constant repair. Extraction: Oils naturally occurring in fruits, nuts and seeds must first be extracted. In the old days this extraction was achieved by slow-moving stone presses. But oils processed in large factories are obtained by crushing the oil-bearing seeds and heating them to 230 degrees. The oil is then squeezed out at pressures from 10 to 20 tons per inch, thereby generating more heat. During this process the oils are exposed to damaging light and oxygen. In order to extract the last 10% or so of the oil from crushed seeds, processors treat the pulp with one of a number of solvents—usually hexane. The solvent is then boiled off, although up to 100 parts per million may remain in the oil. Such solvents, themselves toxic, also retain the toxic pesticides adhering to seeds and grains before processing begins. High-temperature processing causes the weak carbon bonds of unsaturated fatty acids, especially triple unsaturated linolenic acid, to break apart, thereby creating dangerous free radicals. In addition, antioxidants, such as fat-soluble vitamin E, which protect the body from the ravages of free radicals, are neutralized or destroyed by high temperatures and pressures. BHT and BHA, both suspected of causing cancer and brain damage, are often added to these oils to replace vitamin E and other natural preservatives destroyed by heat. In the 1940’s, researchers found a strong correlation between cancer and the consumption of fat—the fats used were hydrogenated fats although the results were presented as though the culprit were saturated fats.54 In fact, until recently saturated fats were usually lumped together with trans fats in the various U.S. data bases that researchers use to correlate dietary trends with disease conditions.55 Thus, natural saturated fats were tarred with the black brush of unnatural hydrogenated vegetable oils. Altered partially hydrogenated fats made from vegetable oils actually block utilization of essential fatty acids, causing many deleterious effects including sexual dysfunction, increased blood cholesterol and paralysis of the immune system.56 Consumption of hydrogenated fats is associated with a host of other serious diseases, not only cancer but also atherosclerosis, diabetes, obesity, immune system dysfunction, low-birth-weight babies, birth defects, decreased visual acuity, sterility, difficulty in lactation and problems with bones and tendons.57 Yet hydrogenated fats continue to be promoted as health foods. The popularity of partially hydrogenated margarine over butter represents a triumph of advertising duplicity over common sense. Your best defense is to avoid it like the plague. The media’s constant attack on saturated fats is extremely suspect. Claims that butter causes chronic high cholesterol values have not been substantiated by research—although some studies show that butter consumption causes a small, temporary rise—while other studies have shown that stearic acid, the main component of beef fat, actually lowers cholesterol.59 Margarine, on the other hand, provokes chronic high levels of cholesterol and has been linked to both heart disease and cancer.60 The new soft margarines or tub spreads, while lower in hydrogenated fats, are still produced from rancid vegetable oils and contain many additives. Not all the societies Dr. Price studied ate butter; but all the groups he observed went to great lengths to obtain foods high in fat-soluble vitamins—fish, shellfish, fish eggs, organ meats, blubber of sea animals and insects. Without knowing the names of the vitamins contained in these foods, isolated traditional societies recognized their importance in the diet and liberally ate the animal products containing them. They rightly believed such foods to be necessary for fertility and the optimum development of children. Dr. Price analyzed the nutrient content of native diets and found that they consistently provided about ten times more fat soluble vitamins than the American diet of the 1930's. This ratio is probably more extreme today as Americans have deliberately reduced animal fat consumption. Dr. Price realized that these fat-soluble vitamins promoted the beautiful bone structure, wide palate, flawless uncrowded teeth and handsome, well-proportioned faces that characterized members of isolated traditional groups. American children in general do not eat fish or organ meats, at least not to any great extent, and blubber and insects are not a part of the western diet; many will not eat eggs. The only good source of fat-soluble vitamins in the American diet, one sure to be eaten, is butterfat. Butter added to vegetables and spread on bread, and cream added to soups and sauces, ensure proper assimilation of the minerals and water-soluble vitamins in vegetables, grains and meat. The Wulzen Factor: Called the "antistiffness" factor, this compound is present in raw animal fat. Researcher Rosalind Wulzen discovered that this substance protects humans and animals from calcification of the joints—degenerative arthritis. It also protects against hardening of the arteries, cataracts and calcification of the pineal gland.63 Calves fed pasteurized milk or skim milk develop joint stiffness and do not thrive. Their symptoms are reversed when raw butterfat is added to the diet. Pasteurization destroys the Wulzen factor—it is present only in raw butter, cream and whole milk. The Price Factor or Activator X: Discovered by Dr. Price, Activator X is a powerful catalyst which, like vitamins A and D, helps the body absorb and utilize minerals. It is found in organ meats from grazing animals and some sea food. Butter can be an especially rich source of Activator X when it comes from cows eating rapidly growing grass in the spring and fall seasons. It disappears in cows fed cottonseed meal or high protein soy-based feeds. 64 Fortunately, Activator X is not destroyed by pasteurization. Arachidonic Acid: A 20-carbon polyunsaturate containing four double bonds, found in small amounts only in animal fats. Arachidonic acid (AA) plays a role in the function of the brain, is a vital component of the cell membranes and is a precursor to important prostaglandins. Some dietary gurus warn against eating foods rich in AA, claiming that it contributes to the production of "bad" prostaglandins, ones that cause inflammation. But prostaglandins that counteract inflammation are also made from AA. One frequently voiced objection to the consumption of butter and other animal fats is that they tend to accumulate environmental poisons. Fat-soluble poisons such as DDT do accumulate in fats; but water-soluble poisons, such as antibiotics and growth hormones, accumulate in the water fraction of milk and meats. Vegetables and grains also accumulate poisons. The average plant crop receives ten applications of pesticides—from planting to storage—while cows generally graze on pasture that is unsprayed. Aflatoxin, a fungus that grows on grain, is one of the most powerful carcinogens known. It is correct to assume that all of our foods, whether of vegetable or animal origin, may be contaminated. The solution to environmental poisons is not to eliminate animal fats—so essential to growth, reproduction and overall health—but to seek out organic meats and butter from pasture-fed cows , as well as organic vegetables and grains. These are becoming increasingly available in health food stores and supermarkets and through mail order and cooperatives. Olive Oil contains 75% oleic acid, the stable monounsaturated fat, along with 13% saturated fat, 10% omega-6 linoleic acid and 2% omega-3 linolenic acid. The high percentage of oleic acid makes olive oil ideal for salads and for cooking at moderate temperatures. Extra virgin olive oil is also rich in antioxidants. It should be cloudy, indicating that it has not been filtered, and have a golden yellow color, indicating that it is made from fully ripened olives. Olive oil has withstood the test of time; it is the safest vegetable oil you can use, but don’t overdo. The longer chain fatty acids found in olive oil are more likely to contribute to the buildup of body fat than the short- and medium-chain fatty acids found in butter, coconut oil or palm kernel oil. Tropical Oils are more saturated than other vegetable oils. Palm oil is about 50% saturated, with 41% oleic acid and about 9% linoleic acid. Coconut oil is 92% saturated with over two-thirds of the saturated fat in the form of medium-chain fatty acids (often called medium-chain triglycerides). Of particular interest is lauric acid, found in large quantities in both coconut oil and in mother’s milk. This fatty acid has strong antifungal and antimicrobial properties. Coconut oil protects tropical populations from bacteria and fungus so prevalent in their food supply; as third-world nations in tropical areas have switched to polyunsaturated vegetable oils, the incidence of intestinal disorders and immune deficiency diseases has increased dramatically. Because coconut oil contains lauric acid, it is often used in baby formulas. Palm kernel oil, used primarily in candy coatings, also contains high levels of lauric acid. These oils are extremely stable and can be kept at room temperature for many months without becoming rancid. Highly saturated tropical oils do not contribute to heart disease but have nourished healthy populations for millennia.72 It is a shame we do not use these oils for cooking and baking—the bad rap they have received is the result of intense lobbying by the domestic vegetable oil industry.73 Red palm oil has a strong taste that most will find disagreeable—although it is used extensively throughout Africa—but clarified palm oil, which is tasteless and white in color, was formerly used as shortening and in the production of commercial French fries, while coconut oil was used in cookies, crackers and pastries. The saturated fat scare has forced manufacturers to abandon these safe and healthy oils in favor of hydrogenated soybean, corn, canola and cottonseed oils. In summary, our choice of fats and oils is one of extreme importance. Most people, especially infants and growing children, benefit from more fat in the diet rather than less. But the fats we eat must be chosen with care. Avoid all processed foods containing newfangled hydrogenated fats and polyunsaturated oils. Instead, use traditional vegetable oils like extra virgin olive oil and small amounts of unrefined flax seed oil. Acquaint yourself with the merits of coconut oil for baking and with animal fats for occasional frying. Eat egg yolks and other animal fats with the proteins to which they are attached. And, finally, use as much good quality butter as you like, with the happy assurance that it is a wholesome—indeed, an essential—food for you and your whole family. Organic grass-fed butter , extra virgin olive oil, virgin coconut oil, and expeller-expressed flax oil in opaque containers are available in health food stores and gourmet markets. 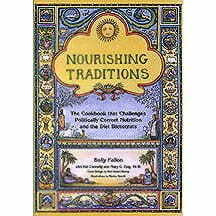 Sally Fallon is the author of Nourishing Traditions: The Cookbook that Challenges Politically Correct Nutrition and the Diet Dictocrats (with Mary G. Enig, PhD), as well as of numerous articles on the subject of diet and health. She is President of the Weston A Price Foundation and founder of A Campaign for Real Milk . She is the mother of four healthy children raised on whole foods including butter, cream, eggs and meat. Can saturated fat actually be good for you?